THE LEGEND OF "CLIODNA "OF THE FAIR HAIR IS A WONDERFULLY ROMANTIC TALE IN CELTIC MYTHOLOGY. 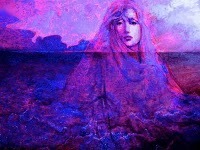 SHE IS THE GODDESS OF THE SEA, THE AFTERLIFE, AND AS THE CELTIC APHRODITE, A GODDESS OF BEAUTY. ONE OF THE TUATHA DE DANANN, RESIDES IN TIR TAINGAIRE, THE LAND OF PROMISE, AN OTHERWORLD WHERE THERE IS NO VIOLENCE OR DEATH. CLIODNA IS THE DAUGHTER OF GEBANN, THE CHIEF DRUID. SHE ALSO POSSESSES HEALING QUALITIES AS ONE WOULD EXPECT FROM A GODDESS WITH WATERY ASSOCIATIONS, AND LEGEND HAS IT THAT SHE TRAVELS WITH THREE MAGICAL BIRDS WHO SANG SO SWEETLY THAT THEY HEALTH SICK WHILE THEY SLEEP. CLIODNA IS THE MATRON OF THE WAVES, ESPECIALLY THE LARGE WAVES AND THE NINTH WAVE OF EVERY SERIES OF WAVES THAT BREAK THE SHORE WHICH IS SAID TO EMBODY HER. SEA BIRDS, SAND DOLLARS, ABALONE SHELLS ARE ALL SACRED TO THIS GODDESS. THEY SAY SHE IS THE MOST BEAUTIFUL WOMAN ON EARTH, AND SHE OFTEN TAKES MORTAL MEN FOR LOVERS, BUT BEING LOVED BY CLIODNA CAN MEAN BEING LOVED TO DEATH FOR SHE TAKES THEM TO THE OTHERWORLD; HENCE, THEY ARE NEVER SEEN AGAIN. IN ONE OF HER LOVE STORIES, SHE FELL IN LOVE WITH THE HANDSOME CIABHAN AND THE TWO TRIED TO RUN AWAY TOGETHER. THE PAIR MANAGED TO LAND THE SHORE OF IRELAND, BUT AS CIABHAN WENT TO GO HUNTING, THE JEALOUS MANNAN, THE SEA GOD, CAME AFTER THEM. HE PLAYED MUSIC FOR CLIODNA UNTIL HE PUT HER INTO AN ENCHANTED SLEEP; HE SENT A HUGE WAVE THAT DREW HER BACK HOME TO THE OTHERWORLD; CLIABHAN WAS DROWNED BY THE SAME WAVE. SHE WAS THEN NEVER ALLOWED TO LEAVE THE OTHERWORLD AGAIN. THE IRISH LANDMARK, TONN CLIODNA WAS NAMED IN HER HONOR. This entry was posted on 9 September 2011 at Friday, September 09, 2011 . You can follow any responses to this entry through the .